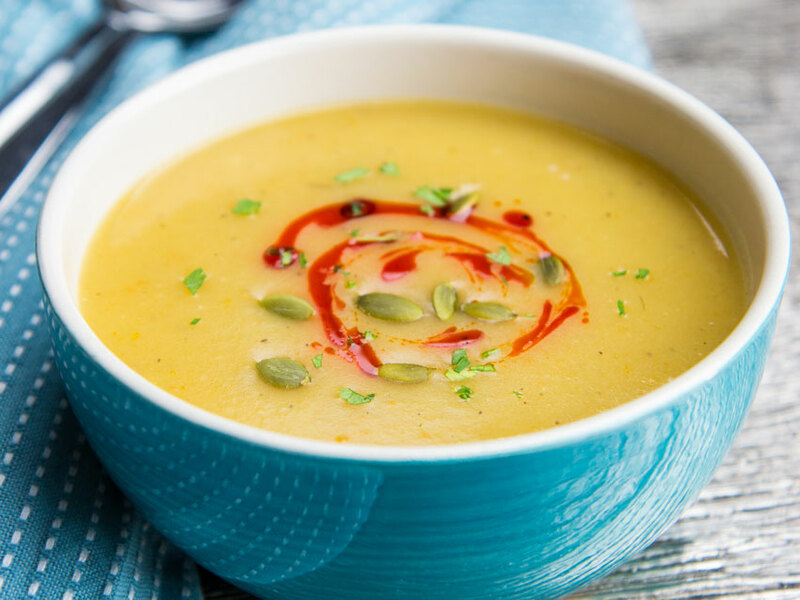 Here's 3 soup recipes for the fall that are really tasty and easy to make. 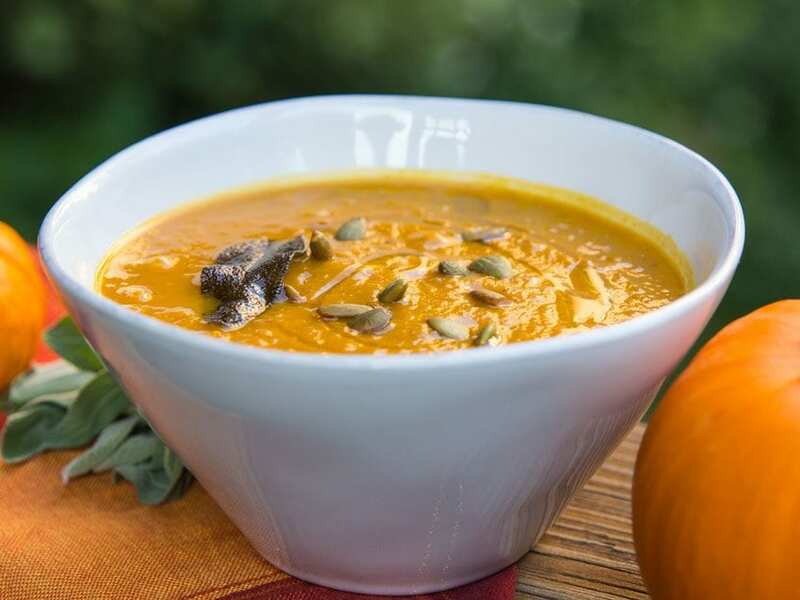 I've got a roasted butternut squash recipe, easy lentil soup recipe, and Dessi's famous spinach and quinoa soup recipe. Fall is the season for soups, but in our house we eat them year round. It’s cold here in Chicago almost 6 months out of the year, so nothing feels more comforting than a warm cup of soup. Here are three of my and Dessi’s favorite recipes for soups: butternut squash soup, lentil soup and quinoa lemon spinach soup. 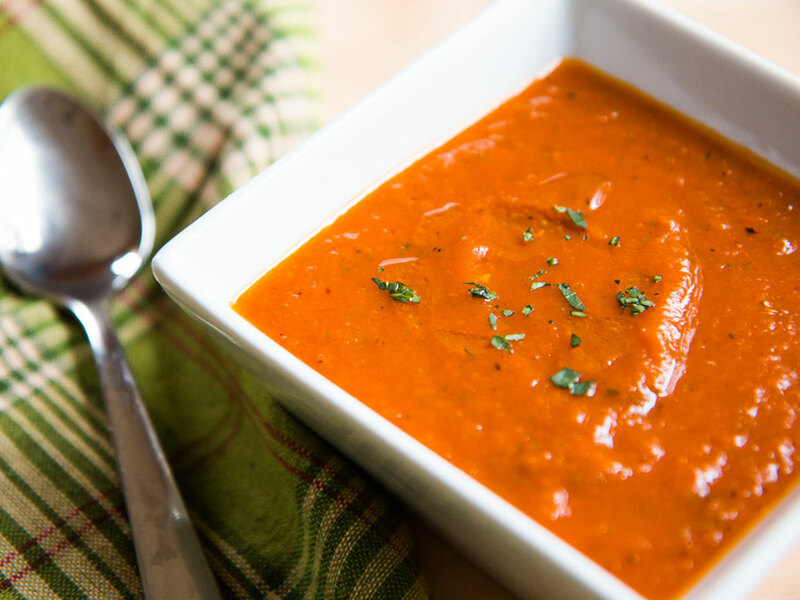 I have a few more fall soups like my roasted tomato basil soup, roasted pumpkin soup, and creamy potato leek soup, so be sure to check them out! This butternut squash soup is one of my all time favorites. It has all those fall flavors like maple syrup, sage, and tons of veggies. The key to making this butternut squash soup next level is roasting the squash (see below how I do that). In the meantime, I saute a hole bunch of finely chopped onions, carrots, and celery in a soup pot. Once the veggies have softened I add some chopped garlic, and a little splash of vinegar to cut through the richness. Then I add some chopped fresh sage and a little bit of maple syrup to reinforce those fall flavors. Once the squash is roasted, I add it to the pot along with a quart and a half of chicken stock or veggie stock. If you don’t have stock you can use water, but the stock will add more flavor. Let the soup simmer for 35 minutes and then blend it with a stick blender to make it creamy. This roasted butternut squash soup gets even better the second and third day, so make sure to make big batch of it! I first safely cut the butternut squash in two with a knife and a rolling pin (see how I do that in the video), peel it, scoop out the seeds, and then chop it into large cubes. Then I add the chopped pieces to a sheet pan and season them with a couple of teaspoons of oil, a teaspoon of salt, and a few cracks of black pepper. Then I roast them in a 425 degree F degree oven for 25-30 minutes. You can turn on the broiler for a few minutes at the end to get a nice toasty color on the squash. Dessi recently came up with this delicious quinoa spinach soup recipe. It is similar to a Bulgarian spinach soup, but she replaced the traditional rice in it with quinoa. This soup only has 4 ingredients and cannot be easier to make. Bring a pot of water to a boil and add about 12 oz of spinach, pinch of salt, crack of pepper and a little bit of olive oil. Sometimes, I use both kale and spinach – it’s even more heartier and nutritious. Let it simmer for 2o minutes and then add the quinoa. Simmer for another 15-20 minutes and then it’s time for the egg lemon sauce. 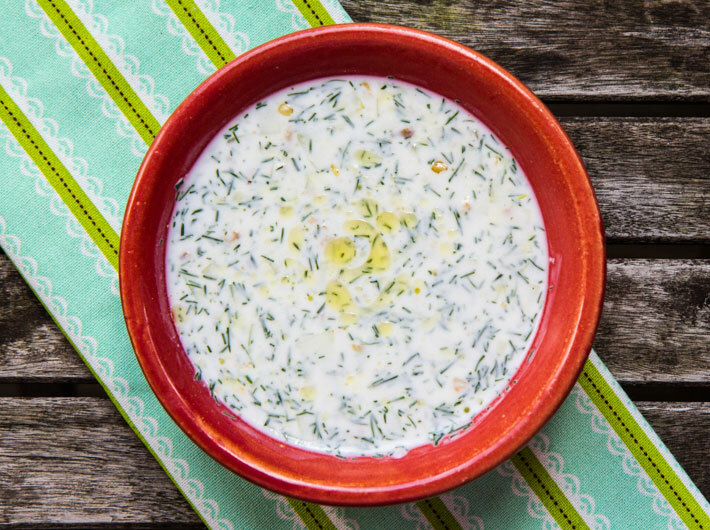 The egg lemon sauce is very traditional in Bulgaria and is typically added to spinach, chicken, or meatball soups. Typically it’s made with eggs, yogurt and lemon, but for this recipe we are keeping it vegan and just doing eggs and lemon. Whisk 2 eggs with the juice of one lemon and then temper the mixture by slowly adding hot soup to it until the eggs are completely tempered. Then you can add it to the hot soup which has been taken off the heat. This technique will prevent the eggs from scrambling. The egg lemon sauce will add some creaminess and acidity to the soup to round off the flavors. How Long to Boil Quinoa? I typically boil quinoa for about 15-20 minutes. You’ll know the quinoa is cooked when the seeds start to look plump and unravel. I boil quinoa almost every morning and then drain it and make my breakfast bowl with it. This lentil soup also comes from Dessi’s arsenal of recipes. This is how it is traditionally made in Bulgaria. Bring a pot of water to a boil and add a cup of lentils. I used yellow lentils in this recipe, but you can use green or black lentils. To that add a roughly chopped carrot, a large potato, and 5 cloves of garlic. I really like how the flavors of the lentils and garlic come together, and that’s why I avoid adding onions to the soup as the onions will overpower the rest of the flavors. That’s the reason I avoid using it in the quinoa spinach soup as well. For some additional flavor I also add some sweet paprika and dried thyme. Then I season it with salt, pepper, and a little bit of olive oil. I let that simmer for 25 minutes. Once the lentils are fully cooked, I fish out the carrots, the potato, and the garlic, add some broth to them, and blend them with a stick blender. Then I add that back to the soup. This adds a nice creaminess to the soup without using flour or dairy. 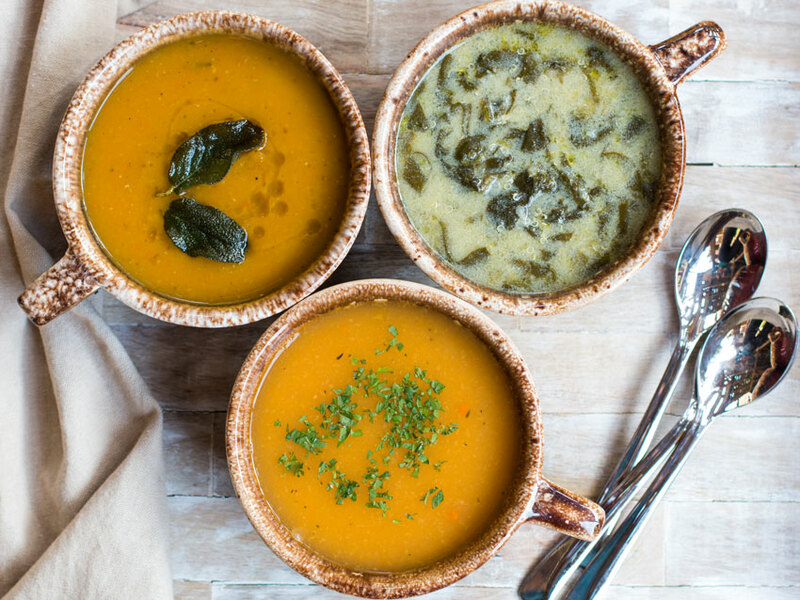 Here are three of my favorite soups: my hearty roasted butternut squash, then a lemony spinach quinoa soup and a lentil vegetable soup. 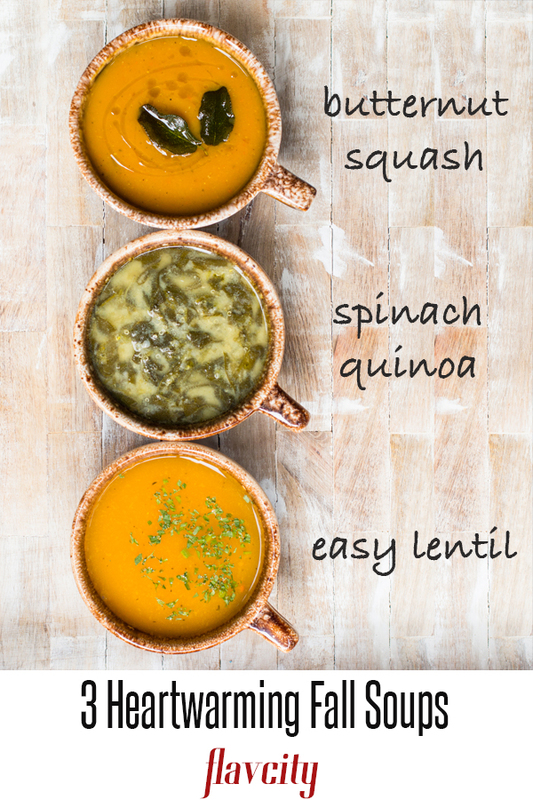 These soups are so flavorful, comforting and tasty and most of all super easy to make! Pre-heat oven to 425 degrees F. Carefully cut and peel the squash and remove the seeds. Watch the video below to see how I safely do this. Place the squash on a sheet tray and toss with a 1 tablespoon of oil, ¾ teaspoon salt, and a couple cracks of pepper. Roast for 30 minutes until nicely browned and cooked through. You may need to broil on high the last few minutes to brown the squash. While the squash is roasting, Pre-heat a soup pot over medium heat with 1 tablespoon of oil. Add the onion, carrot, celery, 1/2 teaspoon salt, and a couple cracks of pepper. Cook for 12 minutes and then add the garlic and pepper flakes, cook another 3-5 minutes or until all the veggies are soft. Add the vinegar and cook for another 1 minute. If the squash is ready, add it all to the pot, if not, turn the heat off the pot and wait for the squash. Once the squash is in the pot, add the maple syrup, sage, and chicken stock. Bring to a boil and then reduce to a simmer for 35 minutes, leaving the pot uncovered. While the soup is simmering, taste it. It will probably need a big pinch of salt. After 35 minutes, take the pot off the heat and carefully blend it up using a stick or hand blender until it is smooth and creamy. If using a blender, only fill the blender half way up, cover the lid with a towel, and be very careful while blending. If the soup is too thick, add more chicken stock. Check for seasoning and add more salt or maple syrup if needed. Serve the soup with a drizzle of extra virgin olive oil and enjoy! Even better the 2nd day. Fill a pot with 2 quarts of water and bring to a boil. Add the spinach, 1 tablespoon of kosher salt, a few cracks of pepper, and 1.5 teaspoons oil. Reduce to a hard simmer for 20 minutes then add the quinoa and cook another 20 minutes. Turn the heat off the pot. In a small bowl, whisk the eggs together with the lemon juice. Pass the mixture through a strainer into a another small bowl. Use a ladle to add a little of the hot soup to the egg mixture WHILE YOU WHISK. This is called "tempering", and will prevent the eggs from scrambling. Add a total of 1-2 cups of hot soup. Add mixture back to the pot, mix well, and check for seasoning. The soup will almost certainly need more salt and perhaps a little more lemon juice. Season accordingly and enjoy. Bring 2 quarts of water to a boil and add all the ingredients along with 1 tablespoon of salt and a few cracks of pepper. Lower to heat to a hard simmer and cook for 30 minutes. Taste the broth after 20 minutes and add enough salt to taste. Remove the garlic, potato, carrots and place them in a medium size bowl along with some of the broth. Use a stick blender to puree the veggies until they are smooth and add back to the pot. You can also do this in a blender. Still well and check for seasoning one last time. Serve and enjoy. One serving is 1 ¼ liquid cup. All soups will keep in the fridge for 5 days or can be frozen for 2-3 months. These look amazing! But my dietary concern is sugar. Do you have the grams of sugar per recipe? I look forward to trying these!! I’m planning on trying one or two of these this weekend and wondered if I can swap in something for the eggs in the Quinoa Lemon and Spinach soup (eggs literally make my husband sick). I know there are plenty of replacements for eggs, but not sure which – if any – would work in this recipe. Hi Trish, the purpose of the eggs is to thicken the soup, so you can sub that out by adding mixing about a 1/2 cup of yogurt with the lemon juice, it will do the job! I have a lot of split lentils in the cupboard I’d love to use. Can’t I use them in this lentil soup or would it ruin it?